Today, in the electronics industry, there is probably no other area which is so poorly understood as ESD. Unfortunately the increase in the occurance of ESD problems has not been accompanied by a corresponding increase in knowledge about ESD. This book was written to take the mystery out of ESD. It explains how ESD is generated, and how it affects electronic equipment. 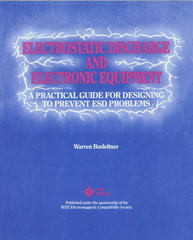 Even more important, this book explains how to design equipment to prevent ESD problems. Finally, a thorough discussion of ESD testing is included, covering not only test hardware, but also procedures and methods that ensure meaningful results. How Sure and How Good?